The Caspian area is the world’s main producer of wild caviar (83% in 2003) and supplies the four largest markets, the European Union, United States, Switzerland and Japan. The construction of several hydroelectric power plants and dams along the Volga river significantly altered the flow of water into the delta and destroyed about 90 per cent of the sturgeon’s spawning grounds, which can be as far as several hundreds of kilometres upstream. 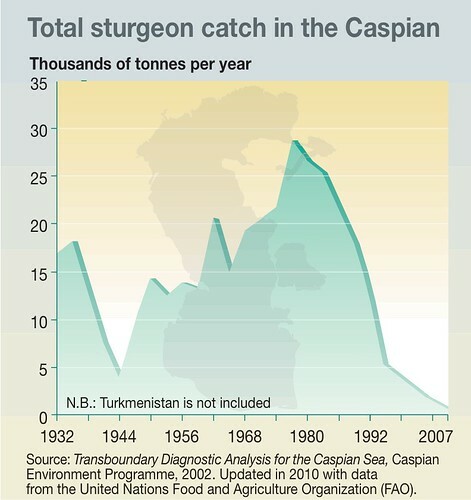 With high levels of water pollution, sturgeons also suffer from various diseases. 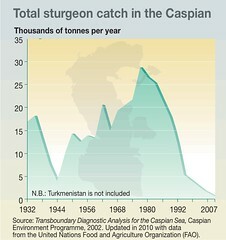 According to the survey of the Food and Agriculture Organization, reported data from Caspian states excluding Iran indicate that the wild sturgeon catch has dropped from an average of about 22 000 tonnes a year in the 1970s to about 373 tonnes in 2008.